Rag Dolls 21cm-24cm. So cute and affordable! Our Mini 21cm Rag Dolls wear removable clothing with lots of detail and pretty fabrics. This size Rag Doll is packaged in a sweet gift box. Rag Dolls 21cm-24cm have been included in Kate Finn’s series of short animated stories about The Finnies. 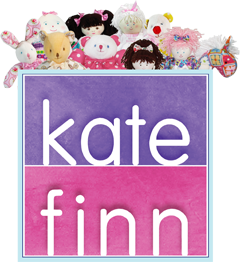 Make sure you treat your little ones to lot’s of fun by downloading the movies from Kate Finn’s Vimeo Channel or watching Kate Finn’s YouTube Channel!